At Steve's Service, we are committed to providing the best commercial plumbing services in San Bernardino County. We offer high-quality, comprehensive plumbing services with exceptional customer service at very competitive prices. All of our plumbing services are provided by well-trained, in-house licensed plumbers who each have at least 15 years of experience. Having worked on thousands of commercial jobs over the years, our plumbers understand how critical it is to minimize downtime, particularly for hotels, restaurants, shopping centers, apartment buildings, and condominiums. That's why we only recommend products and materials that we believe in; use the industry's best service, repair, and installation techniques; and give priority service to our commercial clients. 1,000s of Satisfied Clients. Licensed, Experienced Plumbers. Award-Winning Service. Call licensed and insured Steve's Service today to learn more. Estimates are free, and we're available 24 hours a day to handle plumbing emergencies. Having been named Inland Empire's Best Plumbing Company four years in a row by the readers of the Daily Bulletin, Steve's Service has become known as the Inland Valley's plumber of choice. Steve's Service provides priority service to businesses in need of plumbing repair in the San Bernardino County area. In most cases, we can get on site within an hour of a call and have everything we need to complete the job on the first visit. If we need additional equipment, tools, or materials, we usually have what we need at our main office or can quickly get it from one of our local suppliers. Our prices are competitive, and our repairs are backed some of the best warranties available today. Our plumbing repair services include water and gas leak repair, drain cleaning/unclogging, hydro jetting (to clean pipes and break up grease build up, roots, etc. ), trenchless pipe bursting and relining, and water heater repairs. When we say that we will do whatever it takes to keep you operational, we mean it. Not only do we have experienced plumbers on call around the clock, but we also keep our service vehicles well-stocked with high-quality parts and state-of-the-art tools and equipment, ensuring we complete most repairs on the first visit. Additionally, we have built strong relationships with our suppliers; so if a specialty item is needed, we can trust that our suppliers will open up their doors for us at any time of day or night, including weekends and holidays. We also have our own inventory of specialized equipment, so that we can perform emergency trenchless sewer line repairs as well as commercial drain hydro jetting without the hassle or added expense of equipment rentals. When it comes to commercial plumbing systems, regular maintenance is extremely important to prevent back ups and other plumbing issues. Our maintenance services can include drain cleaning and hydro jetting, grease trap cleaning, gas and water line inspections, tankless water heater maintenance, and more. To determine which plumbing maintenance services your business needs, call Steve's Service today. We'll provide you with a personalized maintenance plan and recommend a schedule based upon your needs and budget. At Steve's Service, we understand that some businesses like hotels, restaurants, apartments, and condos can't afford to shut down everything for a full day or even an hour or two. That's why we offer priority service during the day and convenient after-hours appointments for our commercial clients in San Bernardino County. Not only will we schedule your plumbing repairs or scheduled service for late in the day or in the middle of the night, but we'll also make sure that all of the work is completed before you open in the morning. With over 30 years of experience and extensive training directly from leading manufacturers, Steve's Service is qualified to sell and install commercial sinks, mop sinks, three-compartment sinks, garbage disposals, floor drains, faucets, toilets, urinals, shower drains, automatic faucets, hands-free toilets, drinking fountains, and more for bathrooms and kitchens. Our preferred brands include Sloan, Zurn, Chicago, Fisher, American Standard, Kohler, Franke, and InSinkErator, but we also perform installations for customer-supplied fixtures and related plumbing products. For businesses in San Bernardino County looking to renovate their bathroom or kitchen, we can work off of your plans, match existing fixtures, or provide personalized recommendations based upon your goals, usage, budget, and property. 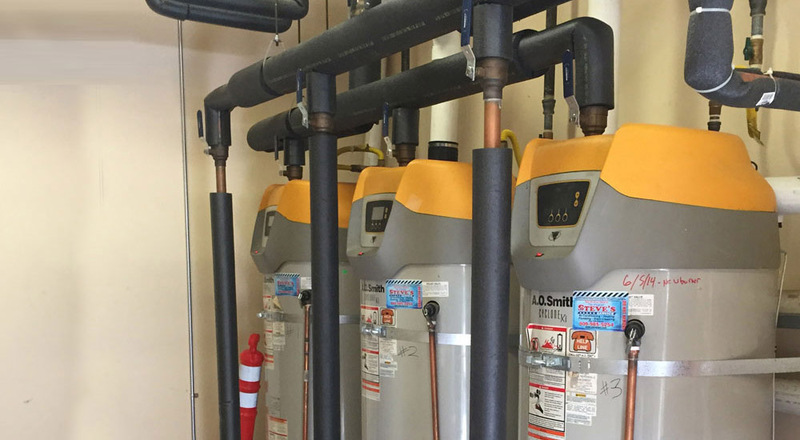 Whether you need water heater sales, installation, maintenance, or repair for your San Bernardino commercial business, Steve's Service is here to provide expert service at an affordable price. We repair and maintain all brands of conventional and tankless water heaters, and are factory authorized to sell and install water heaters from Rheem, A.O. Smith, Takagi, and Bradford White. In every case, we aim to help you maximize your water heater's performance, lifespan, and energy efficiency. Call today to learn more.